The Annunciation (from the Vulgate Latin annuntiatio (or nuntiatio) nativitatis Christi), also referred to as the Annunciation to the Blessed Virgin Mary, the Annunciation of Our Lady or the Annunciation of the Lord, is the Christian celebration of the announcement by the angel Gabriel to the Virgin Mary that she would conceive and become the mother of Jesus, the Son of God, marking his Incarnation. Gabriel told Mary to name her son Yehoshua , meaning "YHWH is salvation". According to Luke 1:26, the Annunciation occurred "in the sixth month" of Elizabeth's pregnancy with John the Baptist. 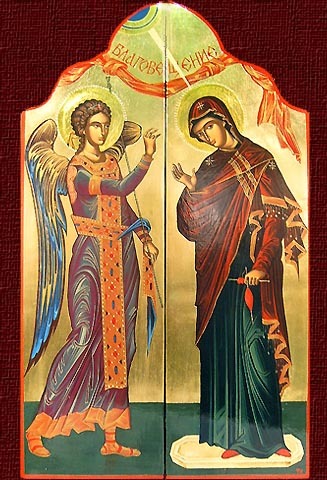 Many Christians observe this event with the Feast of the Annunciation on 25 March, an approximation of the northern vernal equinoxnine full months before Christmas, the ceremonial birthday of Jesus. In England, this came to be known as Lady Day. It marked the new year until 1752. The 2nd-century writer Irenaeus of Lyon regarded the conception of Jesus as 25 March coinciding with the Passion. The Annunciation has been a key topic in Christian art in general, as well as in Marian art in the Catholic Church, particularly during the Middle Ages and Renaissance.